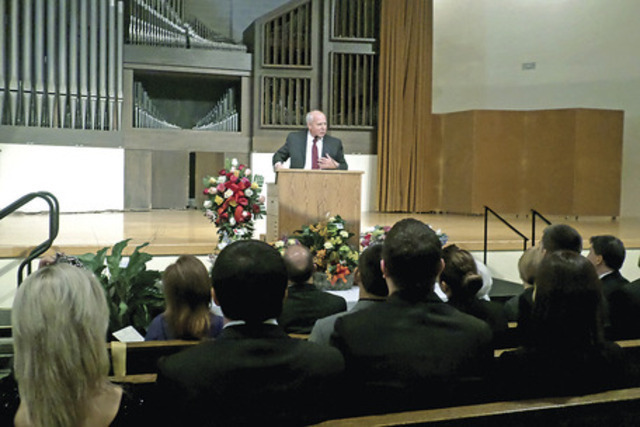 WOOSTER – Al Van Wie was remembered as a man who gave of himself to others, whether as husband, father, grandfather, coach, teacher, mentor or community volunteer during a memorial service Monday at McGaw Chapel. Looking out at all of the people, son Paul Van Wie said the family was humbled by all of the love and support shown following his father’s death Sept. 18. The Dutchman, as Al Van Wie was known, loved life, loved his mother, loved his childhood friends, loved following Willie Mays and the New York Giants, loved coaching football in New York, loved The College of Wooster, loved coaching and teaching young men and women, loved the Wooster Rotary Club, loved the Al Van Wie Rotary Classic, that included a food drive and a clinic for youngsters, loved serving with the Wayne County Committee for Crippled Children and Adults, loved his children, his grandchildren and his wife of 62 years, Judy, Paul Van Wie said. Daughters Jackie Teny-Miller and Jan Adams spoke of love as the cornerstone of their father’s life. While the family didn’t have to tell each other they loved one another at the end of every phone call, Al Van Wie spoke about love through his actions and his attitude toward life and family. He loved connecting with other people, and he recognized and valued people for what they brought to the table. Cabot Rea and his parents, who died 12 days apart of each other in 2010, were friends of Al and Judy Van Wie. When his parents were having a difficult time with their health, the couple came to visit them. Rea sang “Climb Every Mountain” in honor of the Dutchman’s grandchildren. Granddaughter Julie Adams Moore spoke about her grandfather. The two would talk about diet and nutrition. He would ask how many eggs could he eat per week or how much peanut butter was there in a serving. 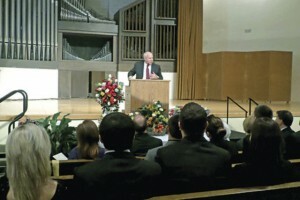 Jon Rose spoke about how Al Van Wie touched so many lives, whether through his service in Rotary (he was a former president), through the United Way, the Village Network, People to People Ministries, the schools, the Committee for Crippled Children and Adults or the Wooster Area Chamber of Commerce. He excluded no one when reaching out to help others, Rose said. When he served on a committee, “He really dug in and made things happen,” Rose said. When the basketball tournament was named in his honor, he urged and insisted it have a service project connected to it. He was involved in all aspects of it. “Actions like this is what leadership is all about, and it inspires others to serve,” Rose said. Reggie Minton, who was on Al Van Wie’s first basketball team, talked about how his coach, mentor and friend is memorialized at the National Collegiate Hall of Fame in Kansas City, where he is featured in the Mentors Circle. Ira Zeff, another former player, said he learned from his coach about passion, loyalty, organizational skills, being a visionary, being innovative and getting involved and making a difference. Those words, “Your country is counting on you” became a burden, Mike Van Wie said. They always stuck with him. But later, they became an inspiration and source of energy for him. He never spoke of this with this father until he was out of the Navy after more than two decades of service. At that time, his father said service was never a burden until it became personal, when he knew those others who were relying on his service. Gordon Collins, who was a colleague at The College of Wooster, talked about how the Dutchman worked to create the North Coast Athletic Conference that would focus on providing opportunities for both men’s and women’s sports. “Bon voyage, my brother and friend. We love you,” Collins said. Andries Coetzee of the Westminster Presbyterian Church, and the pastor of Al and Judy Van Wie, spoke of how Al Van Wie was a person of faith. He saw his faith not so much as a ticket up to heaven, but an opportunity to bring God’s kingdom down here to earth to serve others.